Nicholas David - Team Cee Lo - "September"
I agree with Pat's advice to go all out at this point in the competition, especially if you think you're in the bottom half of the Top 6. The issue here was that this Earth, Wind, and Fire joint was one of the worst possible choices to do something like that. Like Cee Lo has done for most of the season, he chose another played out song that was very difficult to make current. It is possible though, because we saw Colton Dixon knock it out of the park and make it relevant on American Idol. Cassadee Pope - Team Blake - "Stand"
I'm not the biggest Rascal Flatts fan in the world, so I didn't know the song, but if they hadn't told me that this was a country song, I would never assumed that it was. That's what's great about Cassadee. She turns every track into something that sounds like her. She might have had one sharp note in there in the middle, but the length at which she held some of those chorus notes was pretty remarkable. Amanda Brown - Team Adam - "You Make Me Feel Like a Natural Woman"
She is really, really good. The tone and the strength of her vocal made the soft moments leading up to the first chorus just as powerful as the rest. I was on the edge of my seat waiting for the big moments, and unsurprisingly, those were great. It didn't feel like the big event that Adam said it was - It wasn't "Dream on," but it was certainly great. Terry McDermott - Team Blake - "I Want To Know What Love Is"
I have been extremely critical of Terry in the past, which makes the praise I'm about to give him for this performance even more notable. What a great song choice, and what a wonderful idea to strip it down. Terry's voice never sounded better, or tenderer. He really didn't have a place to hide, and he should never hide his voice behind some big, obvious rock song again. Trevin Hunte - Team Cee Lo - "Walking on Sunshine"
"That is the last song I would have expected you to sing," both Carson and Adam said. There is definitely a reason for that. Not only would most anyone have done poorly with yet another prosaic track out of Team Cee Lo, but it was worse for Trevin because it just continued his inability to find a voice. The kid is having an identity crisis in this competition, and I think that may finally knock him out. Melanie Martinez - Team Adam - "Crazy"
First things first. I loved the new hair, the mannequins with guitars, and the fact that she occasionally played a mini, pink piano with one hand. Moreover, the performance was very good, and the take on the track was interesting, but it all left me wanting something more. I got a bit bored midway through, and her lack of a powerful voice kind of hurt her during those "CRAZZAAYYYY" bits. Terry McDermott - Team Blake - "Stay With Me"
While this was back to his comfort zone, it wasn't back to the obvious song choice. This Rod Stewart track made Terry sound like a natural star. The performance may have been a bit cookie cutter at times, but he excelled at every single part of it, so it's hard to complain. Trevin Hunte - Team Cee Lo - "And I'm Telling You I'm Not Going"
It is performances like this that make his first one so much more disappointing. I'm glad Trevin came back into his wheelhouse, and the singing was absolutely flawless here, but it's still hard to be taken aback by that. Not too long ago we all witnessed Jessica Sanchez put forth maybe the best performance in singing competition history on this track. Hers gave us every spectrum of a performance, while Trevin's was one speed almost the entire time. Amanda Brown - Team Adam - "Here I Go Again"
Wait, what was happening? It was difficult to watch through all of the crazy flipping dudes in the foreground, but what we did get to see was fine. You can't argue with her talent, she didn't miss a single note once again, but there was nothing special about this performance. Melanie Martinez - Team Adam - "The Show"
Are you kidding me? What on earth was that? Melanie's performance was fine, but it was really irrelevant because of how awful the production was. This was exactly the time we could have used Simon Cowell on The Voice. He would have ripped that whole thing to pieces for its moving cardboard. I mean that one dude was paddling and squatting up and down. It was a complete distraction from the song, and somebody needed to say it. Cassadee Pope - Team Blake - "I'm With You"
I'm a huge fan of Cassadee, but this was pretty underwhelming. She did nothing wrong, but I got bored midway through this thing. She did much better with her first track, so I hope she isn't in trouble on Tuesday. Thankfully, the coaches made it seem like this was the best performance yet. 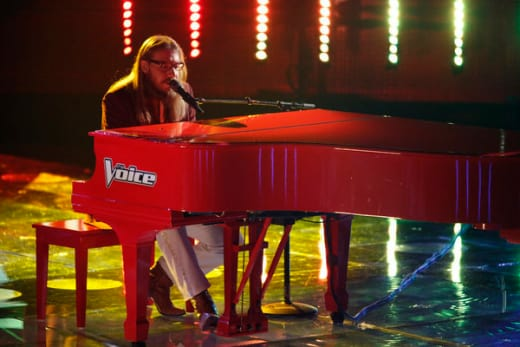 Nicholas David - Team Cee Lo - "Over the Rainbow"
Unlike his first performance - way back at the start of the night - he did a great job changing this historic track up. His unique voice makes every song sound a bit different, but this time he went the extra mile. That upbeat part in the middle was risky, and it paid off.